Russia officially remained silent on the status of its beleaguered Phobos-Grunt Mars probe Friday as concerns grew that the toxic fuel-laden spacecraft could crash back to Earth by December. Efforts to salvage the Phobos-Grunt mission Wednesday and Thursday were unsuccessful, but the Russian space agency issued no updates on the recovery following an initial statement after launch. Phobos-Grunt is still circling Earth at an altitude between 128 miles and 210 miles after launching Tuesday from the Baikonur Cosmodrome in Kazakhstan. 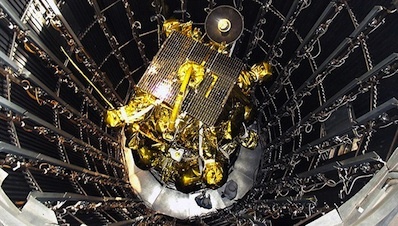 After being shot into orbit by a Zenit rocket, the 29,000-pound spacecraft was supposed to fire its engines twice to accelerate to escape velocity, the speed required to overcome Earth's gravity and head for Mars. But neither rocket burn occurred, and Russian engineers don't know why. Phobos-Grunt's rocket pack was scheduled to fire over South America, out of range of Russian ground tracking sites. Russia did not request support from European and U.S. communications stations in the Americas before the mission, but ESA ground sites in South America and Australia have been listening for radio signals from Phobos-Grunt. Phobos-Grunt was heading to the Martian moon Phobos, where it would touch down, gather a half-pound of samples and return them to Earth in a shielded re-entry capsule. With no success so far in reviving the $163 million mission, experts are more convinced Phobos-Grunt will crash somewhere on Earth in the next few weeks. For now, Russia plans to keep trying. Major General Vladimir Uvarov, a former space expert in the Russian military, told the Rossiiskaya Gazeta newspaper he has lost optimism in Phobos-Grunt's chances for recovery. "In my opinion, the Phobos-Grunt probe has been lost. This probability is very high. At any rate, it is much higher than the chances for reactivating the probe," Uvarov told the newspaper. 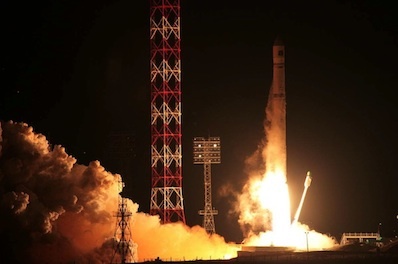 Quoting an unnamed source in the Russian space industry, the RIA Novosti news agency reported Friday engineers were unable to contact the probe Wednesday or Thursday. A report by Anatoly Zak, a Russian space expert, says Phobos-Grunt's low-gain antenna may be blocked by fuel tanks on the craft's rocket pack. The tanks were supposed to be jettisoned after one of the engine firings. The two rocket burns that failed were scheduled to occur within five hours after liftoff without input from the ground. The automated firing sequence ran into a problem, and officials aren't able to diagnose it or uplink any commands to recover. Phobos-Grunt carries a main propulsion unit based on the Fregat upper stage, a space tug that has amassed a successful track record delivering satellites into high-altitude orbits above Earth. Designers added auxiliary propellant tanks, extra insulation and made other modifications for the long-distance journey to Mars. It's also unclear whether Phobos-Grunt is alive and under its own control. Observations from experienced satellite trackers indicate the spacecraft has a steady brightness, meaning it could be stable and not tumbling. Ted Molczan, a respected Canadian satellite observing hobbyist, said Friday that U.S. military tracking data showed Phobos-Grunt in a slightly higher orbit, which could be the result of an intentional maneuver. It's also possible the orbit change could be caused by venting propellant. If Russia not able to save the mission, it will succumb to atmospheric drag and fall back to Earth by the end of the year. With 11 tons of toxic hydrazine and nitrogen tetroxide propellant still in its fuel tanks, Phobos-Grunt's potential re-entry is stirring concerns of space experts after two high-profile returns of large satellites in September and October. NASA's Upper Atmospheric Research Satellite and Germany's ROSAT spacecraft plummeted back to Earth in the last two months. Both satellites fell harmlessly. Phobos-Grunt is more than twice as massive as UARS and five times as heavy as ROSAT, but like all satellites, it's more likely the probe will fall in an ocean of unpopulated area. Nicholas Johnson, an orbital debris expert at NASA, said it is difficult to compare Phobos-Grunt's potential re-entry with UARS or ROSAT. "NASA predicts that in its current condition Phobos-Grunt will not re-enter until next month, possibly even late December," Johnson told Spaceflight Now in an email. "This is dependent upon solar activity and the attitude/stability of the spacecraft. As the re-entry gets closer, the uncertainty in the re-entry prediction will likewise become smaller." The fate of Phobos-Grunt's toxic propellant is also an issue. It could add to the risk of the re-entry if it fell in a populated area. "If the Phobos-Grunt propellant tanks are aluminum, they will probably burn up and dissipate the propellants, whether they are liquid or frozen," Johnson said. Phobos-Grunt also has a capsule with a heat shield designed to return rock samples from Phobos, which could survive re-entry.